Frank D. Camera has been selected to join the nation’s Top 100 Trial Lawyers. Membership into this organization is by invitation only and is extended to those individuals who exemplify superior qualifications, trial results, and leadership in their respective state or major geographical area. Frank D. Camera has extensive experience handling the most serious of charges including murder, narcotic offenses, and all major felonies. 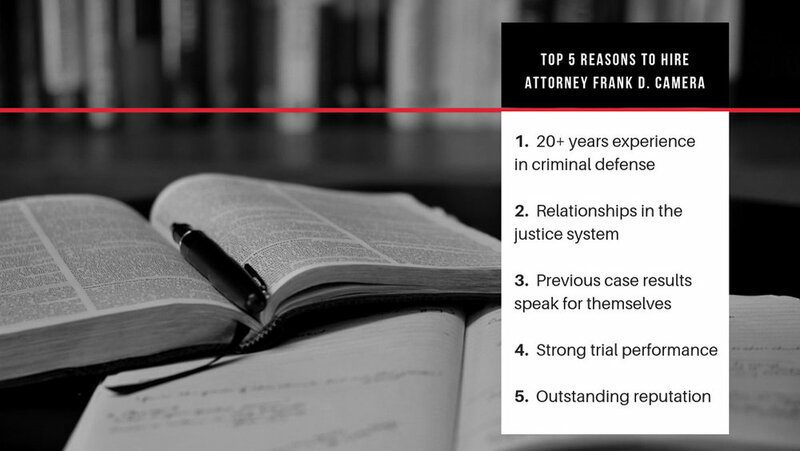 Frank’s skill in the courtroom, and all-around professionalism, has resulted in acquittals in first-degree murder cases, drug charges, and assaults. Contact Attorney Frank D. Camera if you have been charged with a crime in federal court, or in Massachusetts or New York. Frank will discuss your legal options and his strategy for you in a consultation. A man was charged with first-degree murder, armed robbery and accessory after the fact to murder. After a jury trial, the man was found not guilty of the offenses. He is now a free man and gainfully employed. While investigating the cause of a fire in Westport, police seized an AK-47, UZI and other firearms, ammunition and cocaine. After a jury trial, the Defendant was acquitted on all gun, ammunition and drug offenses. Defendant was indicted for conspiracy and possession with intent to distribute heroin. The government was seeking a sentence of 65-month imprisonment. After a plea, the Defendant was sentenced to 36 months imprisonment without any cooperation with the government as well as participation in the Bureau of Prisons Residential Drug Abuse Program, which will reduce his sentence significantly. The sentencing judge allowed the Defendant to self-surrender to his designated prison. A Somerset man was charged with murder. The defense was prepared to challenge the cause of death based on defense expert testimony. On the eve of trial and after months of extensive discussions with the prosecutors, the Defendant was offered a plea to a lesser offense of involuntary manslaughter and was sentenced to 9-10 years imprisonment and was spared spending his entire life in prison. Defendant was indicted for assault and battery with a dangerous weapon, operating motor vehicle to endanger, larceny over $250.00 and leaving the scene of an accident with personal injury after having run the victim over with the vehicle she was driving. After successfully working with the District Attorney’s Office and the Probation Department, the Defendant was sentenced to two years probation and avoided jail time. A recent client was charged with drunk driving. After a successfully litigated Motion to Suppress, which challenged the stop of the vehicle, the case was dismissed. Despite the client's refusal to take the breathalyzer test, which resulted in a six-month loss, his license was reinstated due to the case being dismissed.